Maximum of $15. Coupons may not be combined with any other offer. With Valpak® coupon only. Must present coupon at time of order. Coupon void if altered. Expires 05/02/2019. With $30 minimum order of garments. Coupons may not be combined with any other offer. With Valpak® coupon only. Must present coupon at time of order. Coupon void if altered. Expires 05/02/2019. With $15 minimum order of garments. Coupons may not be combined with any other offer. With Valpak® coupon only. Must present coupon at time of order. Coupon void if altered. Expires 05/02/2019. It’s said – clothes make the man, women and child. 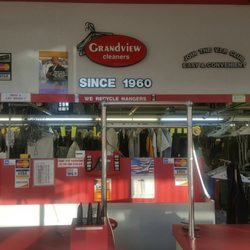 At Grandview Cleaners, we make the clothes clean and we make them fit. We are a full-service dry cleaner that offers dry cleaning, laundry, tailoring and alterations and more. If your laundry is piling up or your dress clothes are wearing down, bring them all over to Grandview Cleaners for expert revitalization. And be sure to take advantage of the printable coupons on this page. Dry Cleaning, Laundry, Alterations, Tailoring, Eco Friendly. We're located in Los Angles and are convenient to Mar Vista, Venice, West Los Angeles, Santa Monica and other neighboring communities.